Why Should I Care About Façade Inspection? The recent street closures in downtown Atlanta during tropical depression Irma remind us of the importance of routine façade inspection. Hurricane Irma was downgraded to a tropical storm over northern Florida and to a tropical depression south of Columbus, Georgia. While both hurricanes and tropical storms typically spawn tornadoes, this was apparently not the case for Atlanta. As can be seen in Figure 1, tropical depression wind speeds are less than 40 mph. 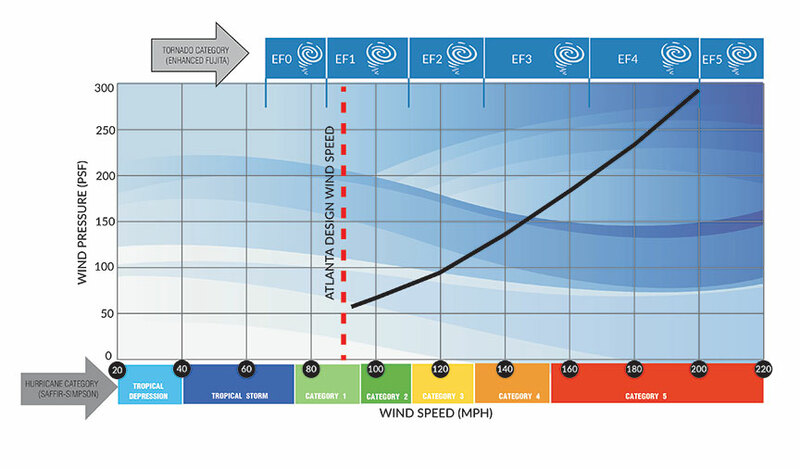 By local building code, buildings and their façades shall be designed for a minimum wind speed of 90 mph. Therefore, the recent façade failures that caused downtown street closures may likely have been developing over time and were simply triggered by the low wind speeds experienced from Tropical Depression Irma. Am I Required To Inspect My Façade? 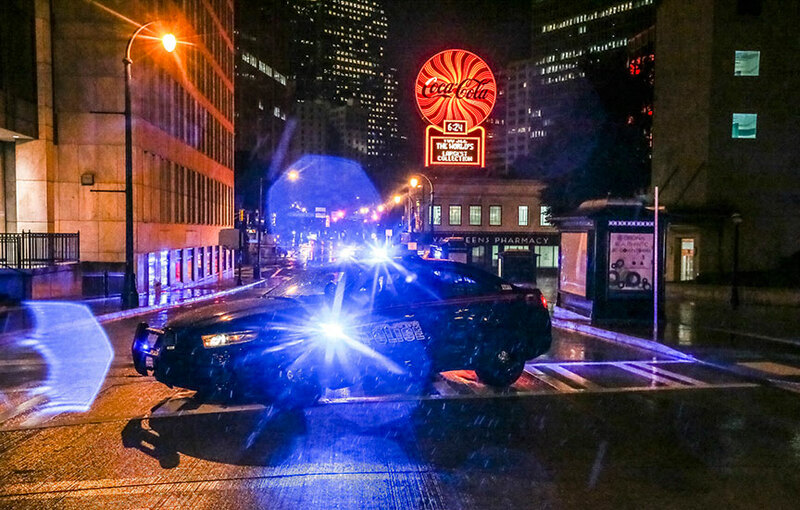 Unlike 12 other major metropolitan areas, Atlanta has no façade ordinance law requiring periodic inspections to help insure public safety from falling building façades. For many of these other cities, it unfortunately took an injury or death to encourage enactment of a façade inspection ordinance. To assist local municipalities with the development of Façade Ordinances, as well as provide private owners with guidance, ASTM E2270 Standard Practice for Periodic Inspection of Building Façades for Unsafe Conditions was developed in 2003. A 2014 version is now available. The adopting authority has only to define which buildings within their jurisdiction require inspection based on height, age, and occupancy. Am I Responsible For My Façade? 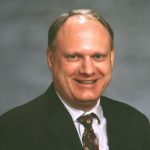 The lack of an ordinance however, does not relieve building managers and owners from liability. The International Property Maintenance Code Section 304.1 requires “The exterior of a structure shall be maintained in good repair, structurally sound and sanitary so as not to pose a threat to the public health, safety or welfare.” This requirement has been in place in Georgia since the adoption of the 2003 International Property Maintenance Code. As a result, the number of façade inspections in Georgia appears to be increasing in the private sector as a matter of risk reduction, even on relatively new buildings. And while the federal government is exempt from local authority, they see the need for them as well. Structural resistance to wind, seismic and gravity loads. Environmental protection from the elements, including moisture and temperature. Unlike the interior of a building, the façade is exposed directly to the elements including extreme temperature swings, rain, snow, ice, wind, carbon monoxide and, in some areas, acid rain. The temperature swings cause expansion and contraction of façade materials, relative to the interior of the building and differentially within the façade itself. In addition, moisture intrusion causes rusting of façade supports and internal reinforcing, and expansion and contraction of masonry and concrete façades. Furthermore, structural supports and foundations can deflect over time under load, sometimes differentially. While these movements can be relatively small, there is no stopping them. Trying to do so leads to façade failures and have even lead to partial building collapses where the façade also serves as a load bearing element. Therefore, it is important to allow for these movements in the design. Unfortunately, thirty or more years ago, little was known about the movement in building façades and thus buildings of this era lacked movement detailing practices common today. Today however, this knowledge is not successfully incorporated into the design or finished construction. In an effort for each building to have its own distinct appearance, façades are often made up of a unique combination of materials and support conditions. While products such as airplanes and automobiles undergo extensive testing of prototypes, building design only gets one chance. What turns out to be unintentional design and construction errors often do not reveal themselves until years after the building is complete. These errors along with the natural aging process, lack of maintenance or a combination of all these factors lead to façade deterioration and failure. Façade inspection is as much art as it is science. According to ASTM E2270, Standard Practice for Periodic Inspection of Building Façades for Unsafe Conditions, inspections are to be conducted under the direct supervision of a qualified professional such as a registered architect or engineer. More importantly however, inspectors should be familiar with how building façades are designed and constructed, how façade materials interact with one another subject to the elements, imposed loads and movements listed above, as well as the possible failure mechanisms involved. Determining the root cause of a deficiency can be very challenging, though possible if you possess the necessary skills and experience. This is what makes façade inspection so satisfying to qualified professionals. ASTM E 2270 lays out a methodical approach to conducting a thorough façade condition assessment utilizing both general (visual at distances greater than 6 ft.) and detailed (visual and hands on at distances less 6 ft.) inspection. One without the other is of little value however. You never know for sure if you have a deficiency or not until you push, pull, probe, and sound the façade, as appropriate. The façade inspection begins with a kick-off meeting that includes the building user and maintenance personnel to obtain historical building information regarding the building envelope including re-roofing, previous repairs, additions and known deficient conditions. Based on availability, existing documents are collected and reviewed such as plans, elevations, wall sections, specifications, and shop drawings for the original construction as well as any additions or modifications affecting the building envelope. Plans and elevations are then reproduced to aid in the inspection and reporting process. When previous façade inspection reports exist, study of them can identify areas where damage, both visible and concealed, may be likely as well assist in prioritizing inspection areas. 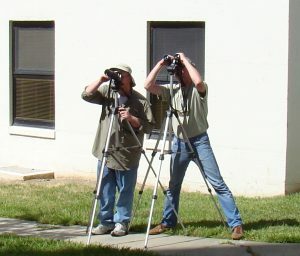 The façade of the building is then generally inspected, thoroughly and methodically by visually scanning the exterior both horizontally and vertically with tripod mounted binoculars, and deficiencies documented with the aid of a camera with a telephoto lens. See Figure 2. The condition of the roofing and parapets are also observed, as they could be sources of moisture within the façade. The purpose of the general inspection is to identify anomalies that require close-up detailed inspection. Thanks to the development of Drone technology, there is now an intermediate step between general and detailed close-up inspection. 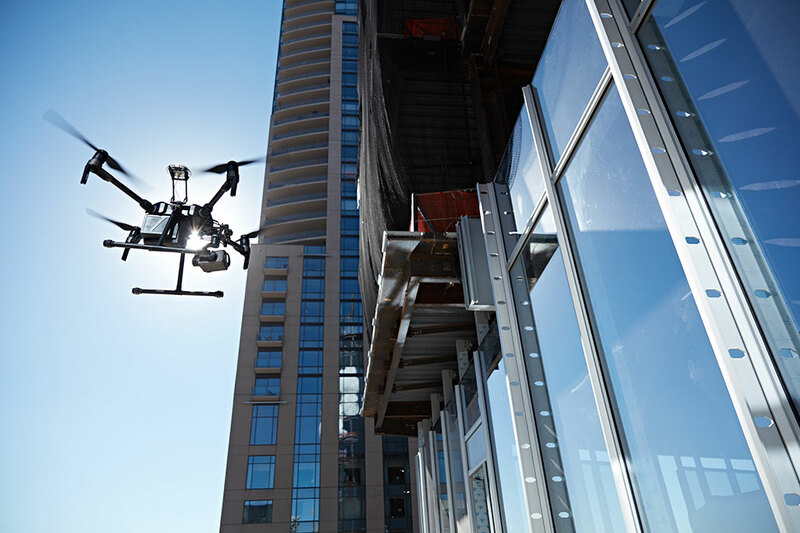 Anomalies identified during the general inspection in difficult to reach parts of the façade, can sometimes be eliminated from close-up inspection with the use of close-up video inspection utilizing a drone. Drone usage requires Title 14 CFR Part 107 Remote Pilot Small Unmanned Aircraft Systems Airman Certification. In addition, a Part 107 Daylight Operations Waiver is required to perform thermal imaging during optimum times of the day. Based on the findings of the general and drone inspection as well as previous history, representative areas are selected to receive close-up detailed inspection. Building heights and access are evaluated to determine if inspections are better conducted from balconies, fire escapes, adjacent roofs, ladder, telescoping boom lift, industrial rope access or a combination. Experience has shown that the use of a swing stage is slow and expensive and therefore inefficient for façade inspection unless a swing stage is already being used for another purpose where you happen to need it. Close-up detailed inspection consists of physical hands-on pushing, pulling, and probing to locate loose and degraded material and sounding to locate areas of delamination and future spalls. At large holes mirrors and/or a remote camera can be utilized to observe and record the substrate condition. Otherwise, holes can be drilled in mortar and sealant joints, with the owner’s permission, and a borescope inserted to observe and record the substrate. See Figure 4. An “unsafe condition” is identified at the time of inspection and poses imminent threat to persons or property. This condition is brought to the attention of the owner, including potential repair and remedial options, so that action can be taken to safeguard persons or property. “Requires repair/stabilization” classifies a condition that could become an unsafe condition if not addressed prior to the next scheduled inspection. “Ordinary maintenance” classifies a condition that should be addressed during the next scheduled maintenance. 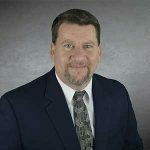 Following the inspection and analysis of deficiencies, a report is generated that serves as a benchmark the owner can use to plan future remedial repairs and inspections. The report should include a description of the buildings construction, modification and repair history, and the means and results of the façade inspection. And finally, while not a requirement of the Standard E 2270, a detailed and reliable remediation cost estimate should be included to help the owner with future planning. We have been fortunate that no one has been seriously injured or killed by falling façade pieces in Georgia. Ignoring your façade doesn’t make a possible ticking façade time bomb go away or limit your liability. Identifying a hazardous building façade is not only a good way to reduce risk, but may just save someone’s life. Associate with Innovative Engineering Inc. has over 14 years experience in design, construction, and restoration industry. 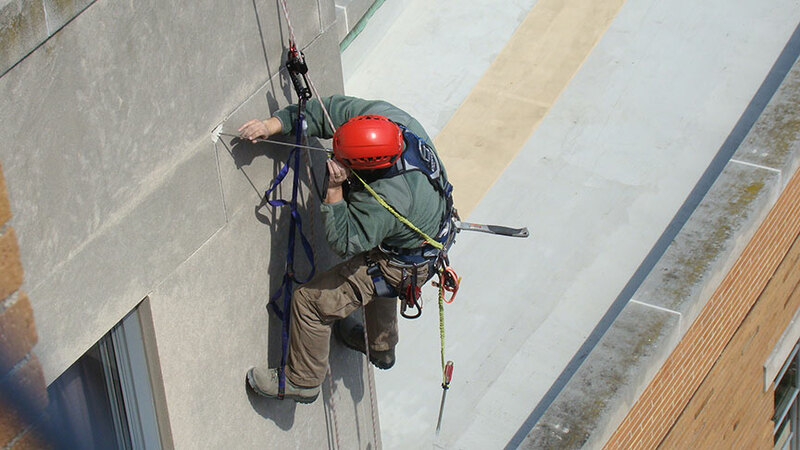 He is a SPRAT certified Industrial Rope Access Technician.